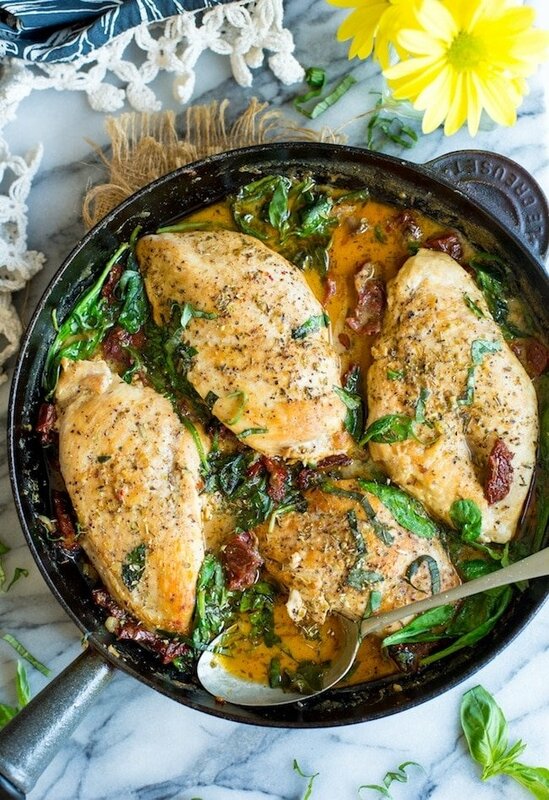 What can I do or say to convince you to make this Sun Dried Tomato Chicken for dinner tonight? And honestly it’s just straight up delicious. I want to bottle up this sauce and just drink but then that would be weird, no? Unlike more traditional Italian style Sun Dried Tomato Chicken recipes this one uses coconut milk instead of regular cream/dairy. I know it sounds weird but trust me – it works. There’s so much flavour coming from all over the place here that you really can’t pinpoint any strong coconut flavours. Just make sure to use an unsweetened milk otherwise those flavours will probably come through. Other than that this is all pretty straight forward. Start off by prepping the chicken by wrapping and pounding the breasts into flat, even pieces. This will not only make the chicken more tender in the long run but will make sure that it all cooks evenly. Sprinkle with a little salt and pepper and quickly brown the sides in a large skillet. After browning the chicken remove it from the pan for the time being to begin working on the sauce. Wipe down the pan and then gently sauté the garlic. Once fragrant add in the remaining sauce ingredients: sun dried tomatoes, coconut milk, stock, lemon juice and spices. Stir it all together and bring the mixture to a boil before reducing down to a simmer to thicken up. After a few minutes add the chicken back to the pan, cover and let it finish cooking through, soaking in the juices as it goes. In the last few minutes of cooking stir in the spinach and the basil and wilt. Serve this over a bed of mashed potatoes or mashed cauliflower to keep it low carb, pour over any left over sauce and enjoy! 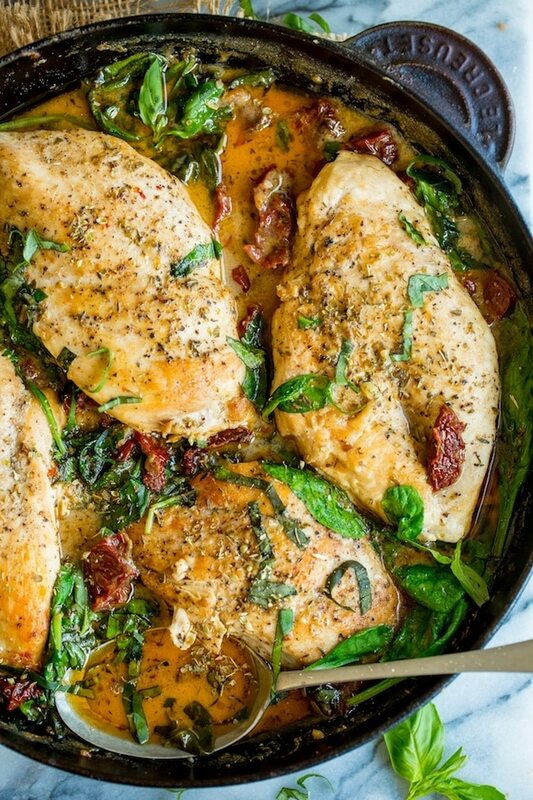 All in all it should take no more than 30 minutes start to finish and you’ve only really got the one pan to clean making it a quick and easy weeknight dinner! Don’t forget to #asaucykitchen on instagram if you try this sun dried tomato chicken! We love seeing what you make! You can also post your pictures to my facebook page! Place the chicken breasts between two pieces of plastic cling wrap and pound them down to make them even in thickness. This will help the chicken cook evenly and make for more tender chicken. Sprinkle each side of the chicken with salt and pepper. Heat 1 tablespoon oil in a large skillet over a medium high heat on the stove. Add the chicken breasts and cook each side for 5-7 minutes or until browned on each side. 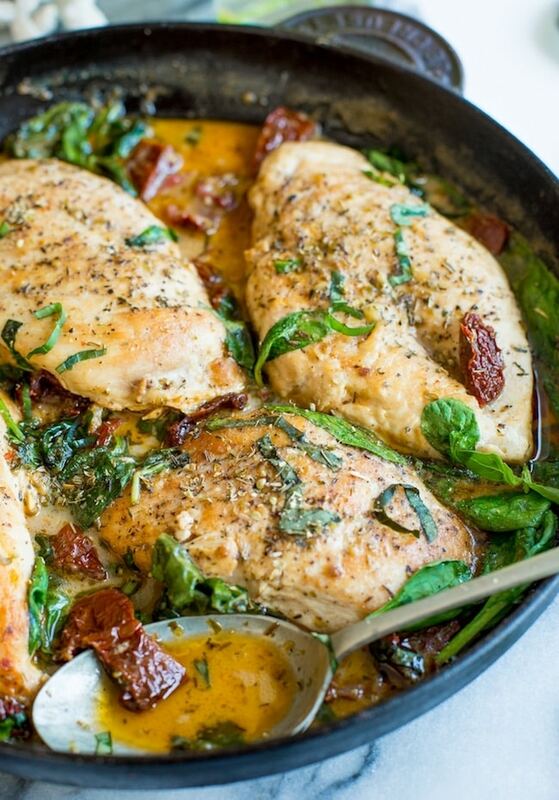 Remove the chicken from a skillet and set aside on a plate. The chicken doesn't need to be fully cooked yet because you'll be returning it to the heat shortly. Wipe down the skillet removing any blackened bits. Add the remaining 1 tablespoon oil to the pan. On a low heat, sauté the garlic for a minute until fragrant. Add the sun dried tomatoes, coconut milk, stock, lemon juice and spices to the pan. Bring the mixture to a boil and then reduce down to a simmer. Let simmer for about 5 minutes to let reduce down. Add the chicken back to the skillet. Cover and let cook for another 5-10 minutes or until the chicken is cooked all the way through. In the last couple of minutes of cooking add the basil and spinach to the skillet and cover with the lid to wilt. Serve over mashed potatoes or cauliflower to keep it paleo/low carb. Garnish with additional oregano and basil as you like and enjoy! Hi Jessica! If you can use regular dairy that would work the best. If dairy isn’t an option then you can use more chicken stock instead – whisk 1 tablespoons tapioca starch or corn starch so that it thickens into a gravy type consistency. Hope that helps! this sauce is so yummy! Thanks Caroline! So glad you liked it!